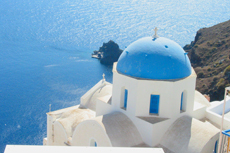 Become acquainted with the ancient island of Santorini -- known to be the site of the lost city of Atlantis -- with a city tour of its charming villages and best sightseeing spots. Not enough time -too much time spent waiting to leave and for bathroom breaks and lunch stop. The highlight of this tour was the prehistoric village on the south end of the island. Toured the island, visited Oia and Thira, had a wine tasting, went up to the Mountain of Prophet Elijah. Very good tour. The only down side was waiting over an hour in line for the tram ride down to the harbor. Met after we got on top of the island via cable car we had a lovely afternoon., unfortunately everywhere was very crowed and HOT but this is expected in the summer and only time grandchildren can travel. We rode electric-assist bikes all around the town. We rode electric-assist bikes all around the town. It was our favorite activity of the week, yet not our favorite city. Athens is like any big city, dirty, polluted and run down. This was the best day of the trip. This was the best day of the trip. it was rainy but warm and the food we ate was amazing as was the island itself. I would go back to see this again. Had a very thorough tour of the island and all of the important cant miss spots. Had a very thorough tour of the island and all of the important cant miss spots. A lot of walking.... and a great lunch! Booked with gold street travel...again not much to see except oia. Booked with gold street travel...again not much to see except oia. The cable car is expensive and stressful with the lines to get back to the ship. What can you say about Santorini? What can you say about Santorini? Beauty everywhere you look -- and this tour gave you enough of the full island, not just the main town. Took the Best of tour through Princess. Just my daughter, me and our guide. Just my daughter, me and our guide. He took us all over the island and would do anything we ask. Added lots of personal experience to the trip and was very considerate. Definitely worth it! It was choppy this day and it was a bit of a job getting off the tender at the port. Santorini is a beautiful island. This island excursion was amazing!!!!! Great tour that included Oia, Fira, the Caldera, a monastery, and everything in between.